With Islamic State Pushed Out, What's Next for Raqqa? Fighters of Syrian Democratic Forces raise a white flag near the National Hospital complex where the Islamic State militants are holed up, at the frontline in Raqqa, Syria, Oct. 16, 2017. They raised a flag in Paradise Square, a notorious traffic circle in which the jihadists had staged brutal public executions, including beheadings, leaving severed heads on display for days afterwards. And then the victors doughnut-spun armored vehicles around in mimicry of how Islamic State militants celebrated their takeover of the city three years ago. There was relief and pride in the faces of the Kurd fighters as they savored the crushing blow they delivered IS this week, marking the end of four months of grueling fighting against the militants for control of the city of Raqqa, the jihadists’ de facto capital. Wrecked buildings now surround the square, renamed during IS’s three-year tenure as “Hell Square.” Like the rest of the city no building has been left unscathed by the battle for Raqqa. But who will rebuild and how fast is unclear. And other questions remain unanswered about Raqqa’s fate. How many of the city’s inhabitants will return and how quickly? Who will govern a city that will struggle to exorcise the ghosts of the medieval-style depravity and cruelty inflicted on it? As in neighboring Iraq, which saw Iraqi forces along with Shi'ite militias and Yazidi fighters wrest control of disputed territory from Iraqi Kurds, other wars are shaping in the wings in Syria, fear locals and analysts. In Raqqa, a civilian council made up of Kurds and Arabs has been set up by the victorious Syrian Democratic Forces, with the support of the United States and other Western backers, to take over the running of the razed city. But resentments could build fast, if local Arabs feel they are being bossed around by the Kurds and are not respected in the governance of the city, Raqqa is historically Arab, not Kurdish. Within hours of the SDF resting control of Raqqa, Arab political activists who oppose IS and the regime of Syrian President Bashar al-Assad expressed disdain. “We don’t consider it a liberation because SDF has committed many human rights violations against civilians,” the activist network Raqqa is Being Slaughtered Silently tweeted Wednesday. “The flags only changed, Raqqa from occupation to another,” the network added. Another Arab activist group, Eye on the Homeland, warned recently that civilian casualties from U.S. airstrikes, up to 2,000 are thought to have been killed in the fight, would allow militants to convince local Sunni Arabs that “these military forces do not have their interests at heart,” providing opportunities for further radicalization. Meanwhile, a humanitarian crisis is worsening. International agencies estimate at least 270,000 people have been displaced from Raqqa, and the camps where they are being hosted have insufficient food, water and medicine. “With high levels of destruction reported in and around Raqqa, most families have little or nothing to return home to and will likely be stuck in camps for months or years to come,” the international aid group Save the Children warned Tuesday. Tuesday, Brett McGurk, the U.S. envoy to the international coalition battling IS, tweeted, “We have pre-positioned aid, will help clear IEDs, restore services.” But at the same time, officials in Washington have emphasized the U.S. role will be limited. U.N. Secretary-General Antonio Guterres urged all parties involved in the Syrian conflict to facilitate access for humanitarian aid to reach Raqqa, while reiterating “the urgent need to reinvigorate the political process” aimed at finding an end to the more than six years of fighting. To the south of the city, Syrian government forces linger. At one point earlier this year it looked as if the Syrian army supported by Russia might be poised to beat U.S.-backed forces to Raqqa. 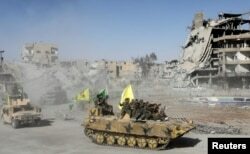 How long before Damascus wants control of Raqqa remains unclear and President Bashar al-Assad has said in the past “Raqqa is a symbol” and that it is his duty to retake all of Syria. He likely won’t have to struggle to recover Raqqa. Officials in Washington say at some stage they will hand it over. People displaced in fightings between the Syrian Democratic Forces and Islamic State militants are pictured at a refugee camp in Ain Issa, Syria, Oct. 14, 2017. But anti-Assad activists question the point of rebuilding in Raqqa or in de-escalation zones being set up by foreign powers elsewhere in Syria, if it merely lays the groundwork for future violence and unrest. Rebuilding before there is a comprehensive political settlement of the Syria conflict is putting the cart before the horse, they say. “Conversations about Syria are quietly shifting away from an evasive political solution and towards the allure of post-conflict reconstruction,” argued Rouba Mhaissen on the website Syria Deeply. “In areas where violence has effectively ceased, violations of human rights have not, and rampant arbitrary detention, forced displacement and the constant threat of retaliation continues,” she added. “In these hints of future conflict and ethnic strife rests the Islamic State’s hope for a comeback,” he adds.